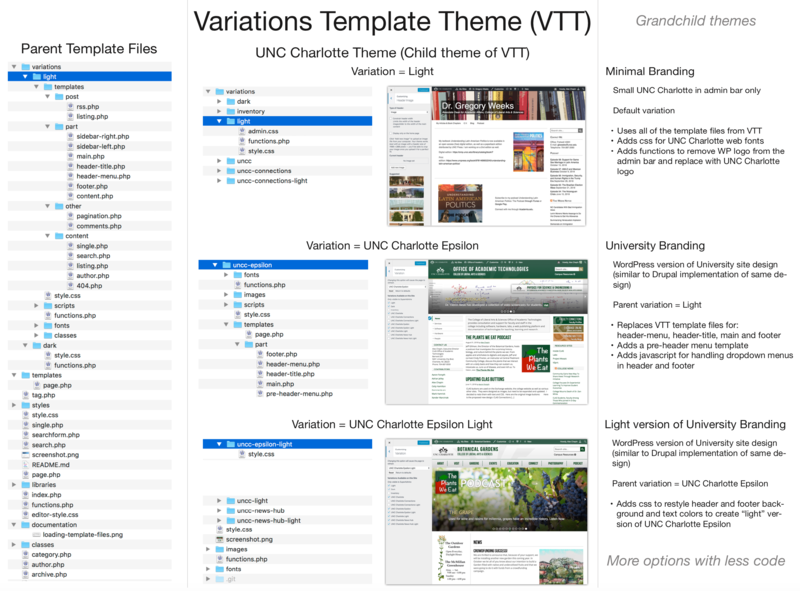 VTT, at its core, is a standalone theme with two variations: a light version and a dark version. The theme uses template parts (introduced in WP 3.0) such as header, footer, and sidebars with a few user-controlled settings via the Customizer. Extending VTT with a child theme is where its real power as a framework comes into play. A child theme of VTT can introduce any number of variations that override the core template parts as well as the stylesheet. In addition, one variation can inherit the template parts and styles of a parent variation. Because of this inheritance, VTT makes grandchild theming possible and does so completely within a single theme: no plugins needed here. Administrators can also control which variations are available on a given site. Additionally, because all variations reside within one child theme, common theme specific settings such as custom CSS, header and background images, title colors, and even widgets are preserved as you move from one variation to another. VTT allows the flexibility you want while keeping your content presentation in the theme, where it belongs.